Warning. This is not a drill. My iPhone will no longer function as a cell phone after crossing the Andes. Wi-Fi is my only lifeline to home. And it’s all my fault. 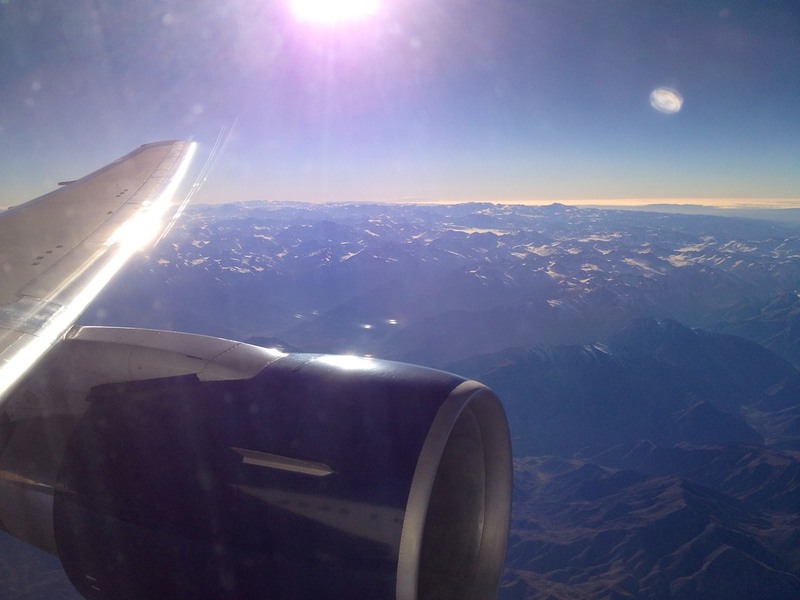 In my last post, you may recall I was preparing to fly to Chile for a work project. My plan was to dumb down my iPhone and only rely on its Wi-Fi capability and use both Apple’s FaceTime and Skype to stay connected with my life in the northern hemisphere. My Delta 767 has just touched down in Santiago. It’s the back-up plane. And what happened to my aircraft? It had equipment problems and was pulled out of service. Its entertainment system wasn’t working. I had scheduled my first meeting in Santiago with a two and a half buffer of flex time for me to chill out after I was to arrive at my hotel. Unpack. Take a shower. Maybe go the bar and try a Pisco Sour. But not anymore. It’s going to be tight. Really tight. As I wait in line at customs, I turn on my iPhone, prepared to begin my little experiment. And suddenly it hits me. I feel a shiver as the adrenaline shoots through my body. I’ve forgotten to forward my normal cell phone number to my new Skype Online Number. D’oh!! It was the last thing I was supposed to do. So now I have a choice. Either leave my cell phone number behind for the week, or open up my device’s defense bubble and try to forward my cell phone number in an unfriendly roaming jungle. Yes, I know I could live without knowing if anyone actually called my cell phone number while I was away, but I had worked so hard to put my plan in place. I just had to know how it was all going to work. It’s like building a rocket ship. If you don’t go anywhere in it, what’s the point? Cut to ninety minutes later. I walk into my hotel room. That meeting is now twenty-five minutes away, and I haven’t showered in thirty hours after two flights totaling eleven hours. Pop Quiz: What do you do? What do you do?! Yeah, I forget common sense and instead pull out my iPhone to make the fix in search of truth. I go to Airplane Mode and flick it off. I feel like I’ve activated Skynet. My phone immediately receives a Chilean carrier signal. It’s a text warning me about international charges. It’s like they were waiting for me. I’m not sure how this is possible as I still have data functionality turned off. No time to think. Must continue. Fast. I go to the call forwarding section of Settings and turn Call Forwarding on. My Skype Online Number is right there, still populating the field from my earlier testing. I nervously flick it on. The phone starts thinking…thinking…. Done. Another text. This one offers my phone a billion texts for a million pesos…or something. OMG. My phone is under attack! The unknown text costs.!! Must get phone back into Airplane Mode. Five seconds later, I get the blast doors closed again. It’s twenty-one minutes till my meeting. Twenty-two minutes later I’m in the lobby. Showered, shaved, and wearing fresh clothes. I only got fours hours of sleep on the plane, but the fact that I am connected makes all the difference. I’m ready for the job. And how did my wireless-less communications strategy perform? First off, I’ve got to say I did feel a little impaired not having access to my full communications arsenal. I felt like I had gone back in time to 2005. But with a little planning… the way things used to work, it wasn’t all that bad. My wife and I set up a video chat in the morning and evening every day with our toddler. Which I think reveals he understood that I was far away. His use of ‘going’ probably meant ‘coming back.’. Very cool stuff. I tried Skype video calling a couple times, but it didn’t seem to work. My wife never answered. Where Skype really came in handy though was just making normal outbound calls. As long as I was on the hotel’s Wi-Fi network, I was set. And I was able to check my Skype Credit balance to confirm that in fact, my U.S./Canada calling plan covered these calls for free. All for that $2.99/month plan. It wasn’t too good to be true after all. And I even received inbound calls on Skype. Remember my call-forwarding hi-stress maneuver? I received a critical voicemail that my work briefcase that was in repair was ready for pick up. Hey, the point is, my little communications scheme worked like a charm. …Except for the lingering fact that I did have to turn on the wireless function the one time, totally against plan. Deep down, I knew there would be damages. As my airplane touched down on American soil in Atlanta on my way back to New York, I immediately released my caged iPhone and reactivated the wireless. It roared back to full functionality as if it never left. We had ten minutes to hang out. So I dialed 611 to talk to the AT&T operator and find out how successful my iPhone lock down had been. Did I cleverly circumvent the traditional international calling payment structure or had I just rung up $300 in roaming fees? The operator asked if I had set up an international plan. No, I said with some small, lingering guilt. There was a long silence as she looked up my account. Yes, she confirmed. There was indeed a charge. My heartbeat started to go up. She wasn’t saying how much. “Text messaging,” she replied calmly. Hmm. Must have been one of those marketing texts when I opened up the floodgates for the thirty seconds. It’s kind of like being a baseball pitcher and missing a no hitter in the ninth inning. But if being a parent of a toddler has taught me anything, an almost perfectly executed plan is something to really cheer about! I glowed with my little success, as I sat on my next plane headed to New York. Suddenly, I experienced a bonus jolt of mini joy as the rest of the passengers boarded. I had previously forgotten that Skype video can work on 3G (4G) if the signal is strong enough. And now that my phone was back to normal, I called the ‘fam’ and did a Skype video chat right on the plane. I felt I was back in time in the ‘60’s in the middle of a science fiction movie about the 1990’s. There was my boy looking around the plane as I described everything to him. His face filled the screen. Now, where do you come in on the ‘should they allow phones to be used to make calls on planes while flying” debate? Apparently the airlines are starting to admit it doesn’t affect the cockpit – which we all knew anyway. Personally – I would rather not have 233 people all around me shouting into their phones “what are you doing right now? – me – I’m making a phone call — ON THE PLANE” – it will be interesting to see what the airlines will decide.